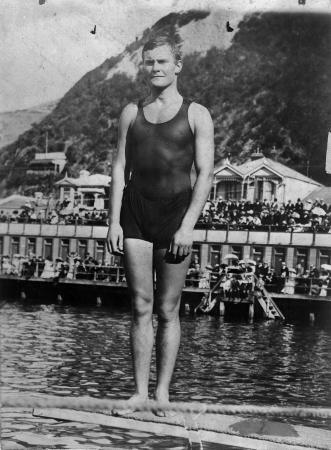 Bernard Cyril Freyberg (later Sir Bernard) on a diving board over what appears to be the sea. The steep hills in the background indicate that the location is possibly Wellington. In the background a large crowd is watching the events taking place. (Bernard Freyberg was an assistant to Mr McKenzie (dentist) in Levin from 1913 to 1914).